This private oasis sits on a lushly landscaped slope overlooking the clear blue Pacific, just minutes from the resort area of Wailea. With spacious one- and two-bedroom units, guests have plenty of room to unwind. Guests have easy access to the Kamaole Beach Parks, world class golf courses, the Wailea resort area and numerous fine shops and restaurants. From the beach you'll even be able to see the islands of Lana`i and Kaho`olawe. An affordable alternative to Wailea's super-resorts. 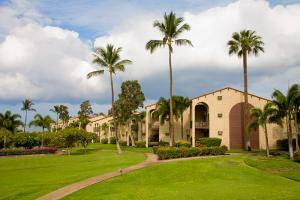 Just 16 miles from Kahului Airport in Kihei and minutes from Wailea. Across the street from beach.